According to research conducted by the department for culture, media and sport, swimming is the most popular form of fitness in the UK. Cited as the preferred activity for men, women and households with children, a trip to the pool even pips gym sessions for the top spot. Despite this, a suggestion of heading to the pool still seems to be met with a marmite-esque reaction by everyone. While plenty of people either make a daily pilgrimage to their local leisure centre or at least wish they could go for a dip more often, there is still a staunch percentage who would rather sit on the side-lines. I am one of these people! For some, this is due to a self-consciousness about their swimming abilities; for others, it’s down to feeling too exposed in swimwear. For me, its both. 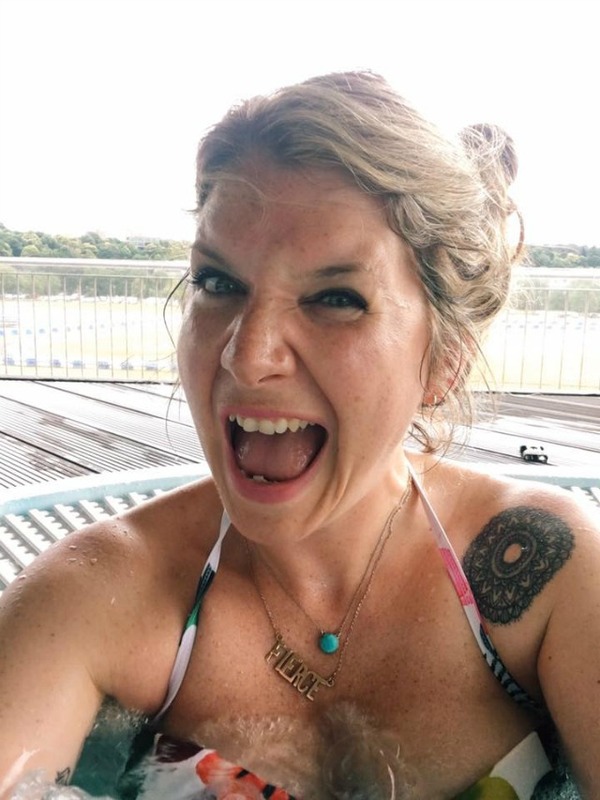 At the ripe old age of 37 I'm still a non-swimmer (I never learnt growing up, although this is something I'm looking into now) and, despite the body positivity movement sweeping social media at the moment, I'm still pretty nervous about being seen in a swimsuit! The lead up to summer is the perfect time to shelve your worries. Swimming is a total body workout, ideal for improving both muscular and cardiovascular strength. Water-based fitness is also ideal if you’re overweight, as the water resistance reduces the strain on your knees that can occur when running. It only takes six steps to get started… Are you ready to dive in? Step 1: Find somewhere to swim. Obviously, you can’t get back into the water until you’ve found a pool you like the look of. Your local indoor pool or lido is an inexpensive place to start, but if you don’t fancy showing your skills off to the whole world then you might prefer something more exclusive. The poolfinder tool is incredibly useful for locating all the pools near your home or workplace, including local colleges with public sessions and private health clubs. Once you get back into the habit of swimming, if you're feeling flush, you could even get a private pool installed. This isn’t a viable option for every home, but you might be surprised at how affordable (and compact) modern pool designs can be. According to my local (Sussex-based) swimming pool specialist, Compass Pools, above-ground exercise pools are just as popular in the UK as full-sized installations. Their reduced footprint keeps maintenance costs down and allows them to be built in compact gardens, while the artificial current allows owners to swim endless lengths. Perfect for a dedicated swimmer. Step 2: Slip into new swimwear. If you like your swimsuit or swimming shorts then you’re more likely to feel good about going for a dip. Treat yourself to some new gear, looking for colours and patterns you will feel comfortable in (admittedly it can be difficult not to feel self-conscious in spandex), and thinking about how the style will help you in the pool. For example, bikinis and loose shorts might look great on the beach, but aren’t going to help you become more streamlined in the water. If you’re still not sure about stripping down so much in public, remember that everyone is in the same position and nobody really cares. It’s a pool, not a bar! Step 3: Be mindful about meals. It’s really important to think about what you eat before you swim. You not only need enough fuel for a meaningful workout, but will want something that your body can easily process so that you don’t get indigestion or need to run to the bathroom mid-swim. Some people prefer to have a larger dinner and skip breakfast pre-swim, but there are a few options available if you’re worried about a rumbling stomach distracting you from your performance. Avoid grains and carbs (like bread and cereal) and stick to lean protein or low-fat dairy products. Smoothies or protein shakes are ideal, or even just a simple banana just to give you an energy boost. There’s a commonly-held myth that you have to wait a set time between eating and swimming but it’s more important that you feel comfortable, rather than hungry or bloated. Step 4: Brush off the dust. Maybe you’ve previously battled a fear of water or simply never had the opportunity to practice. Either way, if it’s been a while since your last proper swim, or you've never learnt like me, then you might want to brush up on your technique. Adult swimming lessons – both beginners classes and refresher sessions – are widely available around the UK, and provide a safe space for you to become more confident in your ability. Classes are usually much more popular than you might think, with swimmers of all ages and abilities seeking to improve. Step 5: Get a motivation system. Finding a swimming buddy is a great way of sticking to your pool appointments. Choose someone who is at the same ability level as you for mutual support, or ask someone who is already an avid swimmer to be on hand to give you tips. Having a training partner in any sport is always a great idea and swimming is no exception. Step 6: Plan your fitness routine. Once you’ve got everything else in place, it’s time to start swimming. The best way to build up your fitness is to spend time in the water every single day, with several 20 to 30-minute sessions each week being more effective than one or two longer swims. Don’t focus on speed, either. Just spend some time getting used to the water and building up your endurance. Speedo actually offer a great workout plan if you need some structure, which works in a similar way to the NHS “Couch to 5k” running plan. Remember, just like all exercise, the key to a swimming-based fitness programme is setting manageable goals and making a consistent effort. You’re not going to see instant results, but keep up a regular routine and you’ll be feeling stronger, fitter and trimmer in a matter of weeks, ready to make some serious waves come summer!